Rajasthan, to put it mildly, is a pretty unique place, and here in Tree of Life we have a wonderfully uniqe resort that suits its surroundings perfectly. On the one hand it’s delightfully over-the-top, its fourteen enormous hillside villas topped with spired domes, surrounded by private gardens, gleaming inside with cool white marble. And on the other it’s a place where your hosts greet you on arrival with a warm welcome and a cool drink, perhaps with the friendly resident labrador at their side. It’s your first of many glimpses at the incredible hospitality that’s customary in this hill town on the outskirts of Jaipur. If you want to live a fantasy of the maharaja’s life, there are several relentlessly opulent hotels in Jaipur proper with your name on them, and there’s no shame in clicking your way toward them. However, if you want to go four-wheeling around the countryside with an actual modern-day maharaja, hopping in and out of his ’65 Jeep to call on his friends around the village, then Tree of Life’s your place. (Just ask the hosts to make an introduction and you’re on the road.) 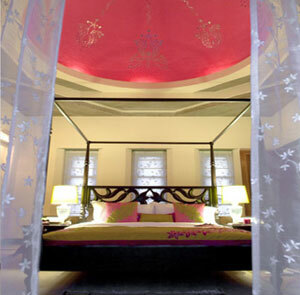 It’d be a shame not to make the thirty-minute drive to the pink city’s famous Red Fort. Just don’t expect it to be the highlight of your trip after you’ve dropped in on a class at the local school, gone on an elephant trek through the hills, attended a sunset jam session with local musicians and practiced your downward dog with a bona fide master yogi. Should that all sound a little too immersive, know that there’s plenty of privacy back in the villas. They’re enormous, for one thing, and they’re scattered over seven acres and fitted with private outdoor spa areas. Opt for a pool villa and — you guessed it — you’ve got your own private pool. Or don’t, and you can still enjoy the public one, spectacularly sited to overlook the surrounding countryside. Likewise, you can take dinner privately in your dining room, or you can choose the more social option of accompanying the chef to pick the evening’s veggies from the organic garden, perhaps meeting the local farmers along the way. The amount of immersion or privacy is up to you; this little garden oasis in the Rajasthan desert is a fine place to hide out, and a fine base from which to stage your explorations. 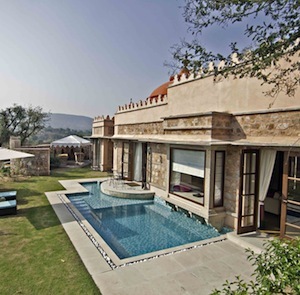 Tree of Life Resort & Spa is located approximately 1-hour (by car) from the Jaipur International Airport (JAI). Please contact CustomerService@TabletHotels.com for assistance with airport transfers.